Macaws are long-tailed often very colourful parrots. They are native to Central America (in particular Mexico), South America and the Caribbean. Macaws can be distinguished from other parrots by their larger beaks and long tails. There are many species to be found at the Hope Zoo but predominantly you will see the Blue and Yellow Macaw named because of the striking blue top parts and yellow under parts. They are popular mainly because of their striking colours and their ability to talk. Some of these birds may also have a more orange or “butterscotch” underside colour. They use their powerful beak for breaking nutshells and also for climbing and hanging from trees and live on a diet of nuts, seeds and fruits. The Jamaican Red Macaw is said to be a relative of the scarlet macaw and has brilliant red under parts, the upper sides of the flight feathers of the wings are dark blue as are the ends of the tail feathers and the tail covert feathers are a light blue. Some may also have green in the wings. The Jamaican Red Macaw is distinct in that it does not have the yellow shoulder patch often found on the scarlet macaw; it’s all black beak and its smaller size. 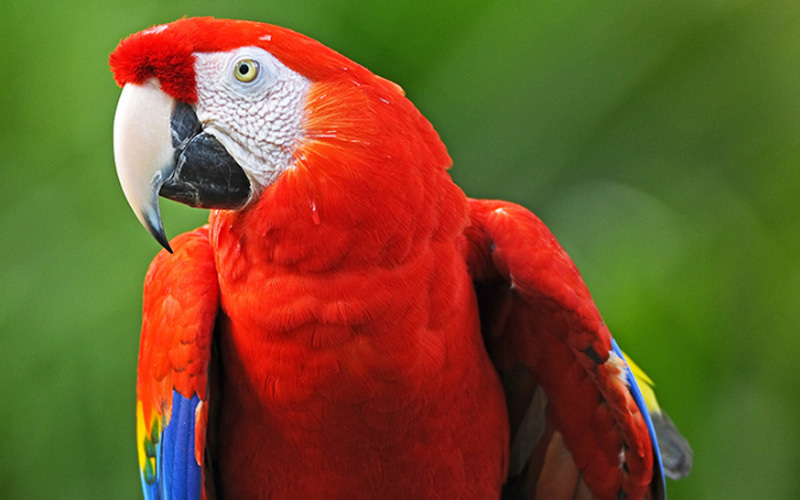 The Jamaican Macaw is native to Jamaica and is considered to be particularly rare amongst the species.